1 lb of sugar to every lb of marrow & 1/2 pint of cold water to each lb of sugar. 1 lb of whole ginger to every 5 lb of sugar. Break the ginger a little & boil it with the sugar till quite clear. 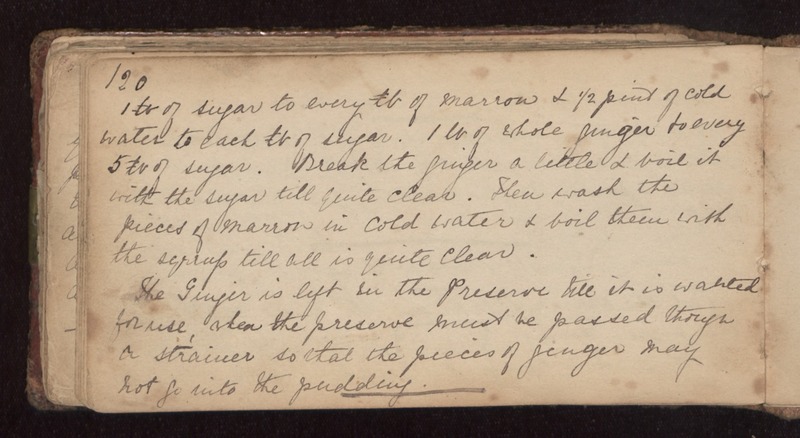 Then wash the pieces of marrow in cold water & boil them with the syrup till all is quite clear. The ginger is left in the preserve till it is wanted for use, then the preserve must be passed through a strainer so that the pieces of ginger may not go into the pudding.